Learn Italian a little a day…every day! | Speak Italian Magically! « Create a ritual to speak Italian very well! Learn Italian a little a day…every day! Be honest with yourself, how much time a day can you spend learning Italian EVERY DAY? One hour? half an hour? Or just a few minutes a day? And be careful, don’t immediately answer one hour a day, because maybe it’s something that you won’t be able to keep in the long run. How many little (or big) commitments do you have every day, beside your work, your school, or family maybe…that can distract you from your goal of speaking Italian very well? If you’re interested in what’s the right way to set goals, I’ve already written about this in Italian in another blog of mine, so I would like to write about something else today. What can you do once you know the basics of the Italian language (maybe because you attended a course for beginners, or completed a book for beginners, such as Assimil Italian) to improve your language skills in a progressive way, even though you have a little time at your disposal? 2) unconscious competence: you found out that Italian as a language exists and you know you aren’t able to speak it; or you found out that there are many rules in the Italian language, but you don’t know how to use them. 3) conscious competence: you have been studying Italian for a while, but you have to think a lot before uttering any single word you have to say and you’re not sure how to say it: you’re a little slow and clumsy. 4) unconscious competence: at this point you’re master of the Italian language (Finalmente!) and you speak it correctly and without thinking about it. If you have finished that basic course of Italian, it’s possible that you are between phase two and three, aren’t you? How can you reach (and faster) unconscious competence? Many linguists - Stephen Krashen among them - state that mastery of a language is a process so complex that it exceeds our capacity for conscious control; so, what can you do to reach the wished unconscious mastery of the Italian language (as if it were your mother tongue)? But you can practice Italian in a pleasant way and even for a little a day! 1) Do you like reading? Do you know that you can read anything that you normally like, but in Italian? Or…Do you like listening? What do you like listening? Do you know that you can listen to anything that you normally like, but in Italian? Do you like watching TV shows? Watch them, but in Italian! This way you will exponentially and rapidly expand your vocabulary, by having fun… If you believe that reading or listening something directly in Italian can be frustrating (because you don’t understand anything you read or listen to - but do you remember what I think about frustration? ), then you could initially choose a book with English translation, or a magazine, such as Pronto Estate 2013 [Do you know that a couple of years ago I recorded the audio of it? 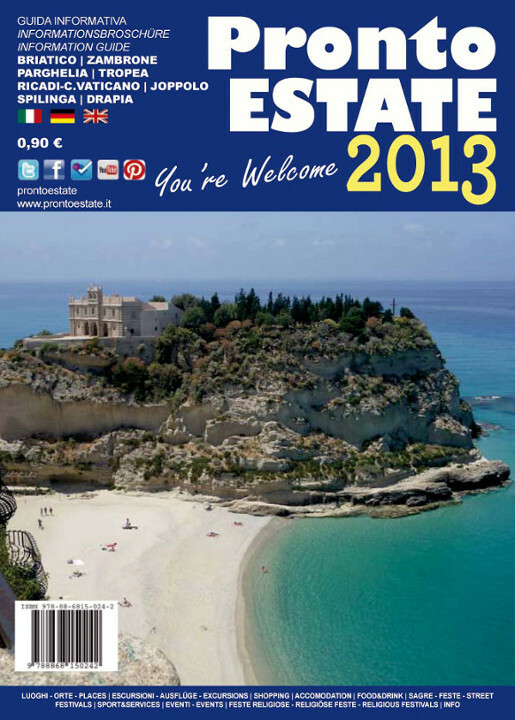 And it's still here in audio and PDF], that allows you to discover Tropea and nearby and it’s written in three languages (and it’s free in the PDF version). Have you ever thought that you can just read a page a day in Italian and constantly improve? If you read one page a day, or you just listen to a little audio a day, it wouldn’t take more than a few minutes. Can you find them, can’t you? 2) You can put yourself in a total immersion situation where you have to speak only in Italian, because no one else speaks your language. In this case be sure that progress will be very fast, and sooner or later you will find yourself thinking in Italian or even dreaming in Italian, why not? If you live in a touristic place where Italians come and visit, you’ll just have to approach the first of them you see and talk with them, or do you believe you’re too shy to do it? Or you could leave and come in Italy on vacation (I hope this is achievable for you! ), but without anyone speaking your mother tongue! 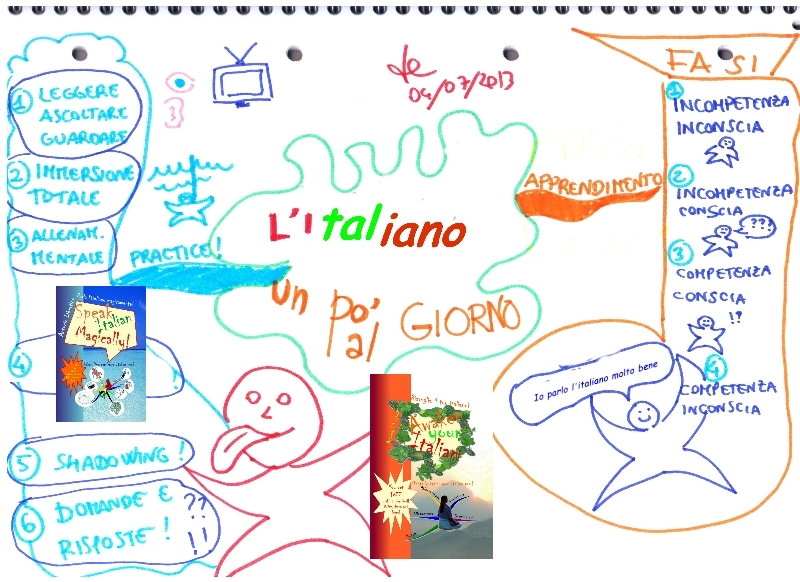 3) You can practice mental training in Italian and for this the course Awaken your Italian can help you! Its bilingual texts and mp3s will explain you how to mentally train to speak Italian very well and they’ll help you internalize the Italian language used in it. Even if there are some lessons that require even 30 minutes (especially the last one) if you have less time, you can choose to quickly reread the lesson, or listen to the questions and answer them as quickly as possible. Avoid putting yourself in a Procrustean bed! 4) You can use any other course with guided imagery in Italian. It’ll be like daydreaming in Italian, while your unconscious mind internalizes Italian and help you start and think Italian. If you don’t know where to start from and you haven’t used it already, dare I suggest my Speak Italian Magically? Lessons will last 10 to 15 minutes…and you’ll really relax into Italian! 5) After listening to a lot of Italian, you can practice shadowing and I have already written about it. This will help your tongue untie a lot - mentally and physically! For how many minutes a day do you want to practice it? It’s up to you! 6) You can have someone ask you a lot of easy questions to answer as quick as possible, so that you’ll automatize the process. Or you can answer the questions that you can find at the end of Speak Italian Magically or Awaken your Italian as fast as you can! There are a lot of things that you can do to daily improve your Italian and you just need a little time to do it…So, next time you say that you don’t have time to improve your ability to speak Italian very well, think about how long you stay in front of TV or social networks and remember about this article and about all the chances you have to do a little a day to speak Italian better and better. P.s. : This article is an adaptation of another article, that I’ve written in Italian on another blog of mine. Are you ready to read it in Italian??? Questo articolo è stato pubblicato in 10 luglio 2013 alle 17:28	ed è archiviato in The course. . Puoi seguire qualsiasi replica a questa discussione tramite il RSS 2.0 feed. Puoi lascia un commento, oppure trackback dal tuo sito.